I created this little recipe as part of the Mackays Christmas challenge. 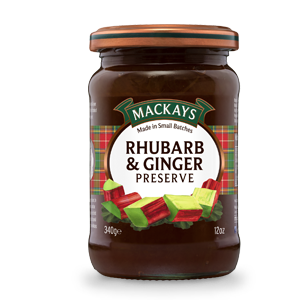 Mackays are a family run business from Arbroath who make jam the way it ought to be made. They produce small authentic batches of preserves, curds and marmalades for that quality home-made taste we know and love. The lovely folks over at Mackays HQ sent me some Rhubarb & Ginger preserve and some luxurious Strawberry & Champagne preserve. More of what I did with the latter on my next post – for now lets concentrate on the former. It is just as well that I was sent two jars as B wasted no time on trying it out … and again …. and again. His new invention was Rhubarb & Ginger jam on little salty crackers and I admit it was rather delightful. B’s innovation gave me the idea for this scrummy sausage recipe. This particular jam marries well with savoury flavours and as rhubarb is renowned to be a great friend of pork, I chose the humble sausage to be the star of the show. Soy sauce added the salty element and some dried chilli flakes sought out the ginger for a double kick. As you know I love to cook but I do not do complicated cooking and there are few recipes more simple than this one. 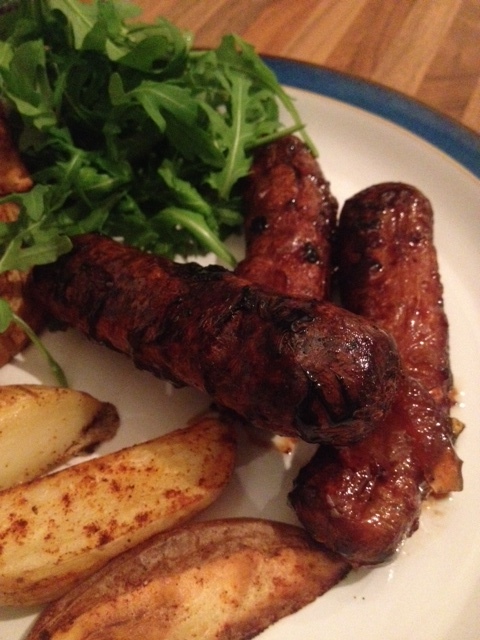 I served my sticky sausages with potato wedges which were liberally dusted with paprika prior to roasting. 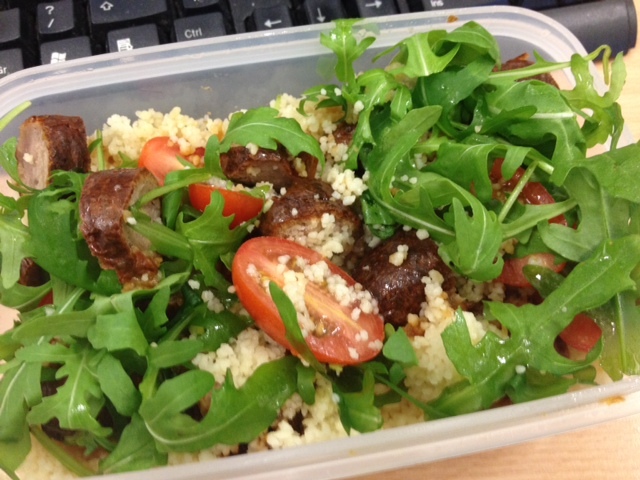 It was a resounding success and as I type I am pausing to take mouthfuls of next day sausage served with cous cous, tomatoes, rocket and a drizzle of olive oil – brilliant. 5. Remove the sausages from the oven and pour the sticky jammy mixture over them making sure that they are all well coated. 7. Persuade your other half to do the dishes – that jammy roasting tin is a killer! Categories: Uncategorized | Tags: Christmas challenge, Mackays, quality pork sausages, sausage recipe | Permalink. My birthday and our wedding anniversary always make this a big week in the calendar. To celebrate both occasions B and I headed off to Edinburgh for day of indulgence in my favourite pastimes – eating and shopping. After managing to lay waste to my lovely husband’s credit card in a number of Edinburgh’s finest department stores it was time to eat. B knows my taste in restaurants very well so my squeak of delight when we walked through the doors of Cafe Marlayne would have come as no surprise to him. 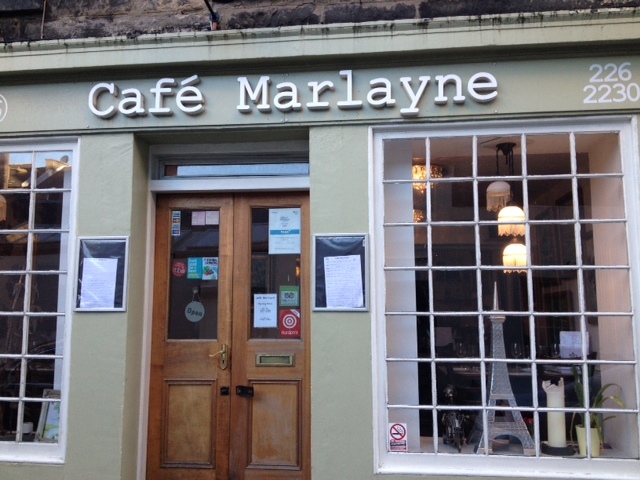 Cafe Marlayne has two establishments in Edinburgh. The newer, larger restaurant is on Antigua Street , however it is the much smaller original restaurant that B had chosen for us. Three phrases to describe my first impressions of this restaurant – utterly charming, quintessentially French and adorably quirky. 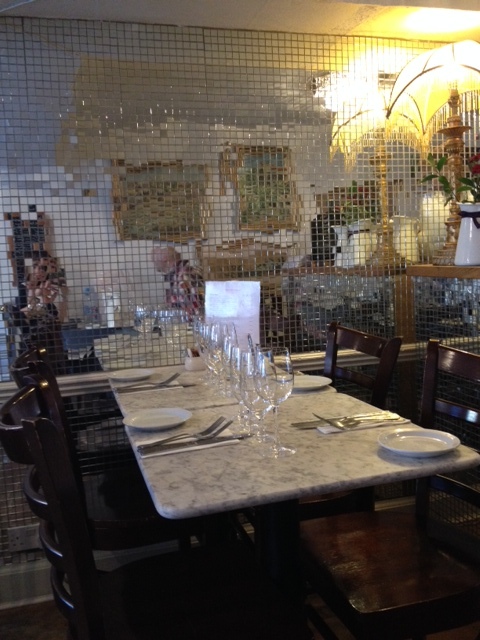 The interior is very small but very beautifully done with marble table tops, a rather unusual mirror ball wall, impressionist paintings and rustic wooden floors. Our waiter (French of course) reminded me of Oskar Werner from the 1960’s classic Jules et Jim – tres authenique. I am sure however that he was hired for his fabulous front of house skills and that his resemblance to a classic character of French cinema was a happy coincidence – or was it? 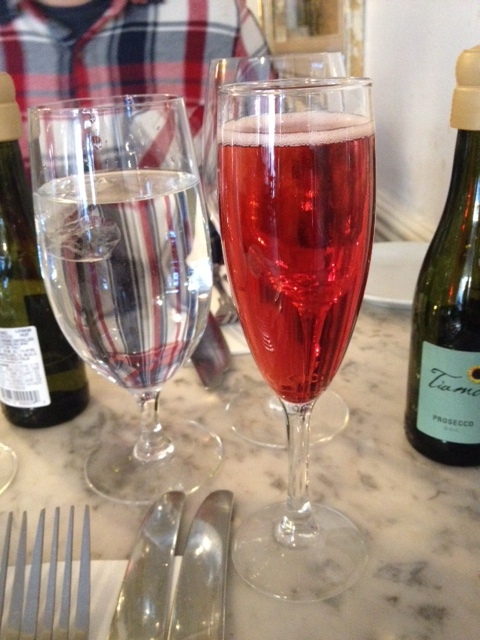 We started proceedings with a kir Royale – an aperitif fit for a king. – and toasted ourselves whilst musing over the fantastic menu. The starters included: Cauliflower soup topped with blue cheese, Boudin Noir with Sauted Potatoes and Apple Compote, Chicken Caesar Salad or Smoked Trout Pate, egg and spring onion with Herb Toast. 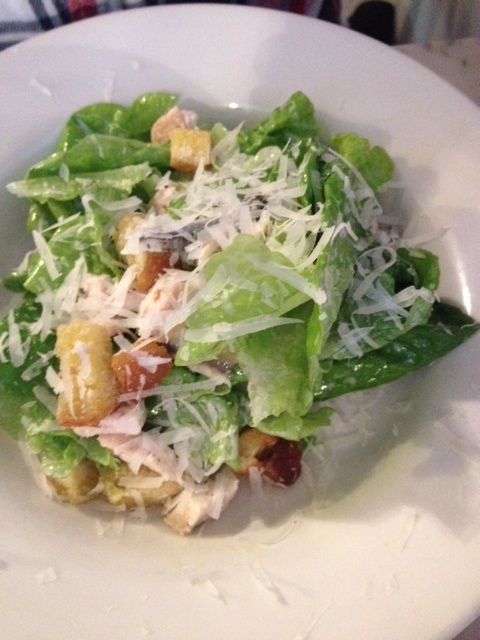 I opted for Boudin Noir and B chose the Chicken Caesar Salad. Boudin Noir is actually one of France’s oldest charcuterie preparations, a fine tradition which has spanned 2000 years, not too surprising therefore that they are rather good at it. Cafe Marlayne import their Boudin Noir from France and it tastes quite different to the black pudding we are used to here. Beautifully crisp on the outside and gloriously soft on the inside with a delicate spiced flavouring. The little sautéed potatoes were done to perfection and the compote served with the Boudin Noir was a marriage made in heaven. I didn’t try B’s Caesar Salad but it looked divine and I was delighted to see that the anchovies were not the big, long, salty, hairy brown variety but the lovely silvery, vinegary, fresh variety. I couldn’t decide between Braised Pork Cheeks in Cider or Venison Sausages with red cabbage, beetroot and apple coleslaw with a maple and balsamic syrup. Similarly B was tempted by both the Pork and Smoked Haddock Fillet on Baby Spinach and Hollandaise. 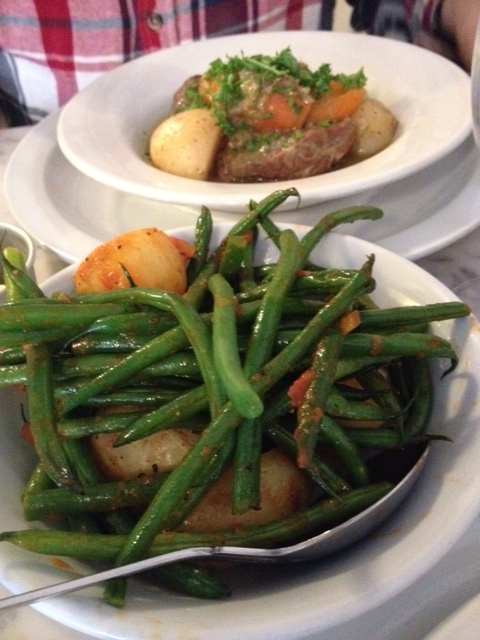 In an unusual move we both chose the Braised Pork Cheeks. 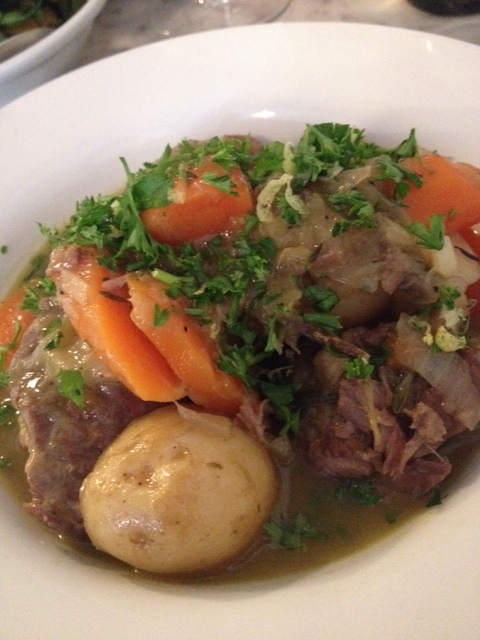 This dish was presented as a stew with potatoes and carrots and topped with a gremolata (a simple mix of lemon juice, garlic and parsley). This was served with French beans and new potatoes in a delicious tomato based dressing. 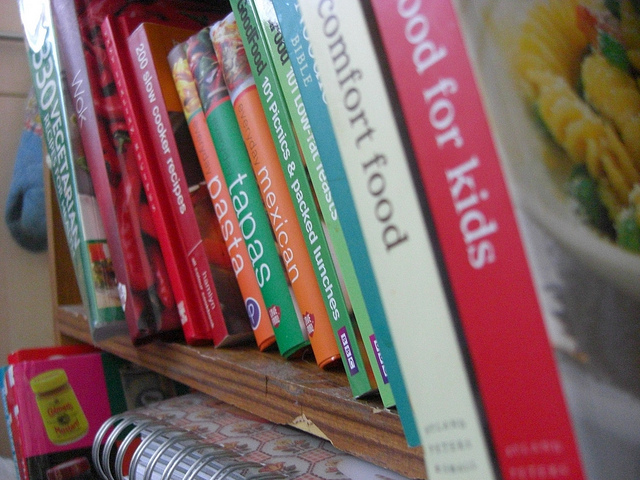 This is the kind of French cooking I love – rustic and warming with not too much fiddle or fuss. Just a touch of the fork had the pork cheeks melting in submission, they were glorious. The flavours in this dish were beautifully layered with every aspect balanced and working in harmony whilst managing to bring out the unique qualities of each individual ingredient – not an easy task. 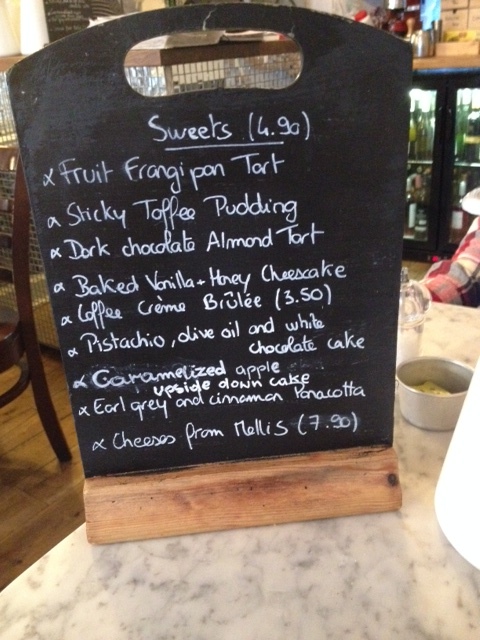 The pudding list was extensive but I could not get past that Sticky Toffee Pudding. I can never get past Sticky Toffee Pudding! I asked ‘Oskar’ if the portions were small and with a bit of a Gallic shrug he described it as a little cube. In reality it was rather a large cube, so large in fact that I couldn’t finish it. 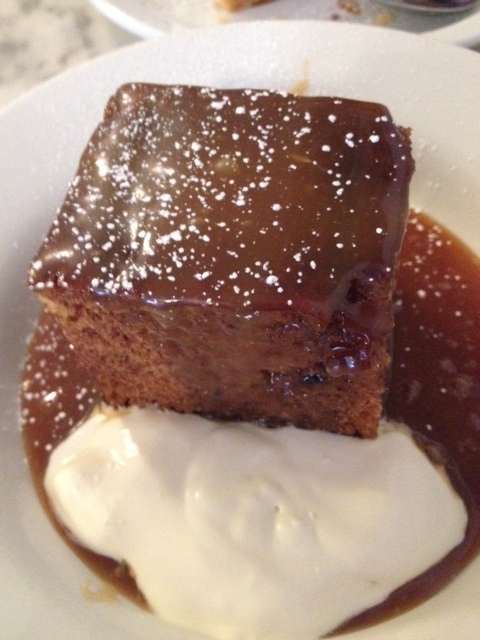 I have never been beaten by a Sticky Toffee pudding until now – it was a sad moment. BUT I have to hand it to them – the pudding was a triumph and B hoovered up my left overs so nothing went to waste. Two Kir-Royales and a three course meal for two came to around £50 which is brilliant value for money considering the outstanding quality of the food. 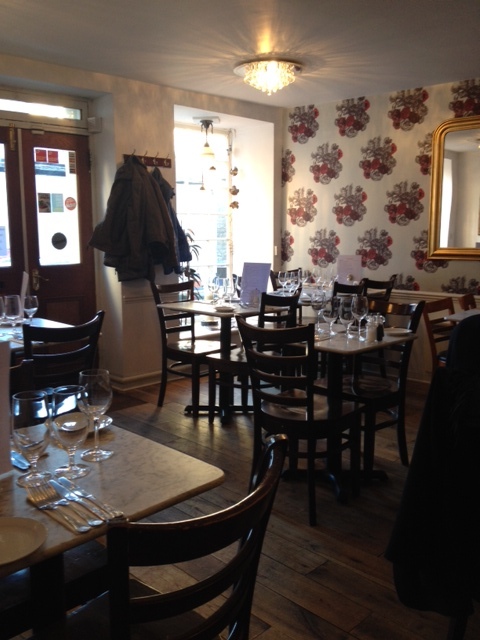 This is a wonderful place for lunch and I imagine it would be an intimate and romantic evening venue. It is French bistro dining at its best and the decoration and feel of the restaurant transports you to a simple, relaxed restaurant in the back streets of Paris. I for one will be back. 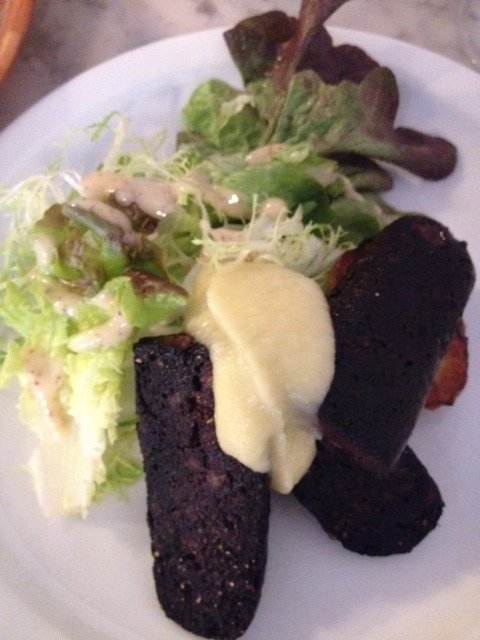 Categories: REVIEWS | Tags: Boudin Noir, Cafe Marlayne, Edinburgh | Permalink.